Bandhavgarh National Park is one of the more popular national parks in India located in Madhya Pradesh. It was declared a national park in 1968, with an area of 105 km2. 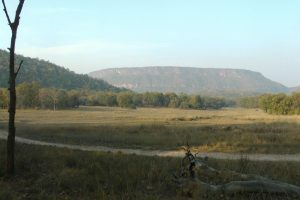 This park has large biodiversity and the density of the tiger population at Bandhavgarh is one of the highest in India. The park also has a large breeding population of leopards, and various species of deer. 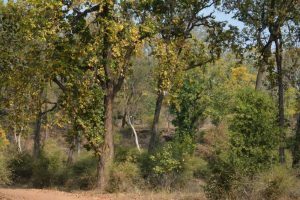 As mentioned in the introduction Bandhavgarh is very famous for its high density of tigers and in our visits, I am very pleased to say, we have had many fine sightings of this majestic animal. In total it contains 37 species of mammals and, according to forest officials, there are more than 250 species of birds, about 80 species of butterflies, a number of reptiles. 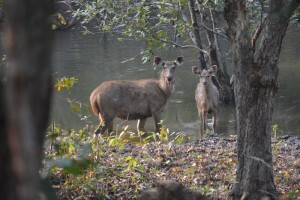 Notable mammals are the gaur, or Indian bison, sambar, barking deer and nilgai are to be seen in the open areas of the park. Indian jackal can be seen regularly as well as Indian wild boar. There have been reports of the Indian wolf, striped hyena, and the caracal the latter being an open country dweller. The tiger reserve abounds with chital or the spotted deer which is the main prey animal of the tiger and the Indian leopard. The park is made up of, fairly open, dry, deciduous forest with a lot of Sal trees. There are also areas of grassland as the photos below show.